Localization is one of the key ingredients in the transition from the growth economy to a steady state economy. As we change our economic focus from the global back to the local, we build an economy (and a community right along with it) that is more connected, more resilient, and more neighborly. A vibrant local economy develops and supports local businesses and keeps wealth circulating within the community. The layout of the community is designed (or re-designed) for the human scale, meaning people can readily navigate their communities and develop a strong sense of place. Housing, perhaps the most important component of community infrastructure, is comfortable, efficient, and practical in a steady state economy. Oversized mansions are replaced with more sensible housing stocks that use land and energy resources responsibly. In a steady state economy, people enjoy their sensible homes and experience the enhanced sense of community that comes from participating in the local economic scene. interactions and use fewer resources. When economic growth is the overriding goal, the result is broken communities, impractical living arrangements, and the wrong conditions for a neighborly spirit. Sprawl, runaway housing construction, and poorly planned shopping districts are the norm – in short, places that aren’t worth caring about. isolation and makes it hard to get around. 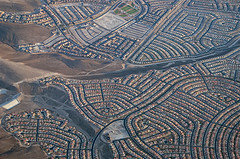 Architects, city planners, and citizens have been examining the problems of sprawl and poor community and housing design for decades. One response to these problems is the development of intentional communities. Cohousing is a type of intentional community in which residents form a modern-day village, typically with the goal of living simple and sustainable lives. 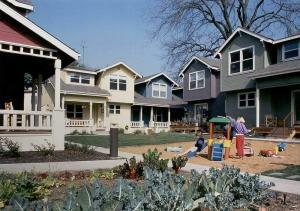 People living in cohousing neighborhoods report stronger connections with their neighbors and more efficient use of resources.